With over 19 million visitors annually, London remains one of the world’s most visited cities. Whether you are planning a short city break here or re-locating to London for work or study, our area guides aim to provide you with a flavour of the different areas of London. Read on to find out more about St John’s Wood (including the types of homes available, safety and transport links). Where is St John’s Wood located? A district of northwest London, St John’s Wood is well known for some popular British attractions; including Lord’s Cricket Ground, Regent’s Park and Abbey Road Studios. It is an extremely affluent neighbourhood, and home to the only nature reserve in the City of Westminster. An NW8 postcode, St John’s Wood is about 4km northwest of Charing Cross. Maida Hill sits to the south, West Kilburn to the west, South Hampstead to the north and Regent’s Park to the east. The south boundary of St John’s Wood is Regent’s Canal. What’s the typical accommodation type in St John’s Wood? St John’s Wood properties vary from flats to full terraced and semi-detached villa houses but they all have one thing in common: they’re very expensive to buy! Property prices in the neighbourhood have risen by up to 12% in the last year alone, and so residents of this area tend not to move out once they’re in. On the property market therefore, mainly flats are available; with houses sold and occupied by families from generation to generation. You’ll notice high walls around many of the detached villas in St John’s Wood – that’s to keep prying eyes and paparazzi out of the way! How safe is St John’s Wood? The affluence of St John’s Wood means that it is considered extremely safe. Its residential areas may be quiet at night but areas such as Abbey Road are always busy with tourists and so feel extra safe round-the-clock. Many of the residents are families with young children and its low profile being slightly out of the centre of the city affords it a degree of quiet and low crime that just isn’t accessible more centrally. What type of people live in St John’s Wood? St John’s Wood is a very well-off area and so those that live there tend to be either long-standing resident families or professionals. Several celebrities and high-net-worth individuals reside in the area as well as large American and Jewish communities. After-hours activities bar the odd restaurant or bar are off-limits here, so you won’t find students or young professionals in this district. Instead, it’s more of a haunt for those who want to live the city lifestyle with all the perks but retire in the evenings to a leafy suburb that’s tranquil and friendly – and with bigger houses available than more central neighbourhoods. Current residents include members of the Dutch Royal Family, Keith Richards, Mark Ronson, Ewan McGregor, Kate Moss and Sir Paul McCartney! What transport links does St John’s Wood offer? The London Underground station here runs on the Jubilee line and takes just 14 minutes to get to Waterloo, as well as quick connections to Bank and Canary Wharf for city commuting. Should you prefer walking, Oxford Street, Marylebone and Baker Street aren’t far; and are cyclable from one of the Santander Cycles docking stations in the area. As a neighbourhood surrounded by many other residential areas, you’ll find plenty of through-routes on buses as well as regular taxi and private transport services. There’s also two night buses, so you can get around safely at all hours (should you need to!). What is there to do in St John’s Wood? Whilst many living in St John’s Wood choose the area because of its lack of nightlife, that doesn’t mean you’ll be short of activities to try in the area! There’s plenty of amenities and attractions that won’t require you to venture far. 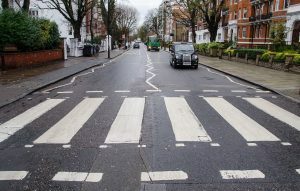 Best known for the studio album by the Beatles, you’ll find tourists on Abbey Road all day long – mainly darting through traffic to have their photo taken strolling across the zebra crossing! Whilst the novelty will no doubt soon wear thin if you stay here, of course you’ll have to nip by for that all-important photo moment! The picturesque Primrose Hill makes for a lovely afternoon stroll with views across London without having to climb steps or brave a viewing tower. A hill of approximately 213ft, you’ll find an outside gym and children’s play area here alongside the entrances for London Zoo and Regent’s Park. Lord’s Cricket Ground is world famous and can hold up to 28,000 people for international matches! Daily tours of the ground are available and include viewing the actual Ashes cup, sneaking around the player’s changing rooms and learning more on the history of the sport. If you are an international student, intern or professional looking for homestay accommodation (“host family”) in St John’s Wood or close by, we would love to hear from you. Similarly, if you have a spare room in your St John’s Wood home and are interested in hosting international students, please do get in touch.